I love my Bumbo chair. I bought it for Norton and used it as our first “high chair” when we started solids. 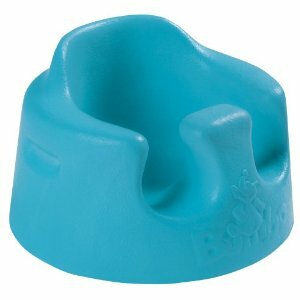 However, the Bumbo chair has been the subject of many a product safety recall. Today, Health Canada and the U.S. Consumer Product Safety Commission announced yet another joint product safety recall on the chair. The Bumbo has been recalled. Again. Generally, the Bumbo chair consumer product safety recall happens for one simple reason: parents are not using the chair properly; a kid topples the Bumbo over and falls from a decent height. If you’re lucky, the kid is only scared and screaming. If you’re one of the not so lucky ones, your kid ended up with a skull fracture. This time, the solution is to put yet another warning on the seat to warn parents not to use on a raised surface. And now for something different: they’re adding seat belts as part of the recall repair kit. Either way you slice it, it comes down to the same thing: if your kid gets a skull fracture using the Bumbo chair, chances are really good that you’re not using it properly. I strongly suspect that there will still be recalls in the future because of parents not using their heads or thinking that the safety warnings don’t apply to them. But that’s another rant.